I estimated 250-300 hours went into this over the last four months, nearly every day since the beginning of December. So I am burnt out, but I should write about this undertaking before I forget it all in the midst of catching up on all the other stuff I meant to do during the past few months. :P So be on the look out for that. Thanks for all the comments. :) And nice to hear from some of you we haven't heard from in awhile! 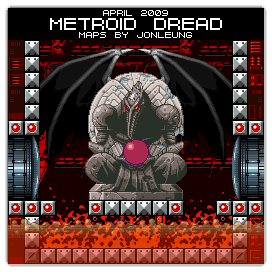 I decided to write a bit about the making of Metroid Dread, the April Fools' Day joke for VGMaps.com (http://www.vgmaps.com) this year. For those of you who may be unfamiliar, my site hosts a number of video game maps, most of them being screenshot maps, i.e. maps constructed from actual in-game graphics. Every month, a well-made and complete map set from a particular game is chosen to be featured as the "Maps Of The Month (http://vgmaps.com/NewsArchives/MapsOfTheMonth.htm)". However, as an April Fools' joke, April's Maps Of The Month features a complete map set of a non-existent game, meant to confuse and amuse fellow gamers. This year's joke is a map set of the (still?) non-existent Metroid Dread. See the joke HERE (http://vgmaps.com/NewsArchives/April2009/index.htm#MetroidDread). On May 16, 2008, a hidden topic on the VGMaps.com forums (http://www.vgmaps.com/forums/) was made, with which only a few selected regulars had access to, and the brainstorming process began for what the 2009 April Fools' joke should be. A user by the name of marioman made the first suggestion, which was for maps of Metroid Dread. A few other suggestions followed, but to me, the idea of Metroid Dread always seemed to be the most enticing, due to the infamy it had garnered over the years. The problem was that, at the time, we did not yet have maps of Super Metroid (Super NES), Metroid Fusion (GBA), or Metroid: Zero Mission (GBA). Considering that it was believed Metroid Dread would be in the classic 2D style and on the DS, it was likely that it should somewhat resemble any or all of those particular Metroid games. If only we had maps of them, we could, as I have described in simple terms, "cut them up into little pieces, recolour or modify them, and Frankenstein them back together into another game." On June 7, 2008, mappers named rocktyt and zerofighter contributed full map sets of Metroid Fusion (http://vgmaps.com/Atlas/GBA/index.htm#MetroidFusion) and Metroid: Zero Mission (http://vgmaps.com/Atlas/GBA/index.htm#MetroidZeroMission), further increasing the likeliness that a believable Metroid Dread might be possible. Eventually it was clear that this was the project to do. But we all knew it wouldn't be easy. For the sake of consistency, only one person would work on it, and as I profit the most from such a venture, and like three of the past four April Fools' jokes, it would all come down to me. Which was fine, as I wanted to do it, but it was by no means going to be a walk in the park. The texturing phase involved taking tiles from the other Metroid games, recolouring and/or modifying them (or sometimes not), and then placing the tiles, often by hand, on top of all the green squares. Occasionally, perhaps due to the nature of the tileset I was using, curves, slopes and corners might not look right, or I would just encounter other oddities, so I would have to tweak the "blueprint" along the way. (Texturing certainly required a different thought process than the initial tiling; I had to select a good tileset, colour it correctly, and fit it properly. If tiling is about function/shape, then texturing is about fashion/style, in a way.) Texturing sometimes took a long time; even after preparing the tiles to use, it would still take a long time to manually hand-place every tile, since there was considerable variety unlike the tiling phase which only dealt with underlying green tiles. In some areas, under the floor or above the ceiling, there would be random tiles, and though they were chosen and placed by hand in the first two areas, I would use the method suggested by user Maxim, to make an image with random noise, then reduce the number of colours to the number of tiles I wanted in the random pool, and then I would increase the image by 16 times in both height and width, and then use the Tile Slicer/Splicer program created by Revned to replace the tiles with the chosen tileset. (Revned's Slicer/Splicer comes in handy as a tile replacer, which was actually created in response to the first April Fools' joke (http://vgmaps.com/NewsArchives/April2005/index.htm#LegendOfZeldaLinksAwakeningAdvance), after he learned I did the tile replacement solely by hand.) Anyway, at the end of the texturing phase, I would have something that more resembled a Metroidish area, just without a real background. 2006: Mega Man Solid X: Guns Of The Mavericks (http://vgmaps.com/NewsArchives/April2006/index.htm#MegaManSolidXGunsOfTheMavericks) - a Mega Man X-like game featuring FOXHOUND members from Metal Gear Solid, now represented as robotic animals derived from their codenames, as they are named in the same manner as the Mavericks in the Mega Man X series (it makes a lot of sense if you've played some games from both series) - check out bustin98's incredible artwork!